Laid down, circa April 1944, as a Maritime Commission type (S4-SE-BD1) hull under Maritime Commission contract (MC hull 1873) at Consolidated Steel Corp, Wilmington, CA. 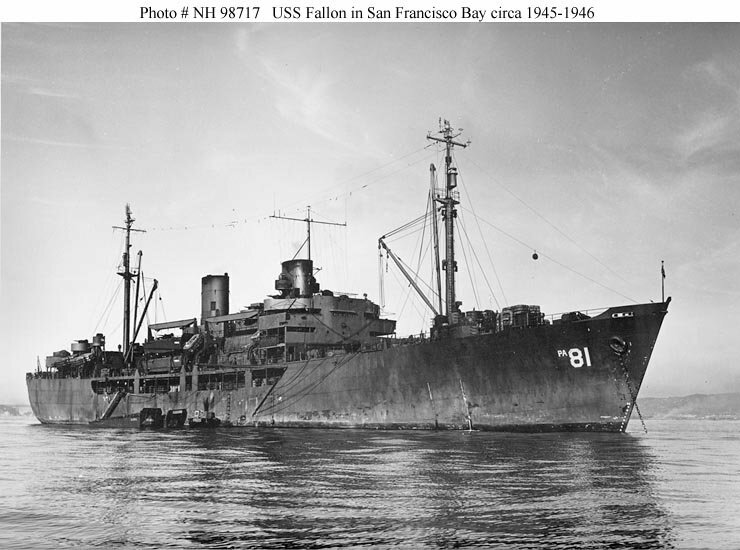 79k USS Fallon (APA-81) at anchor in San Francisco Bay in late 1945 or early 1946. 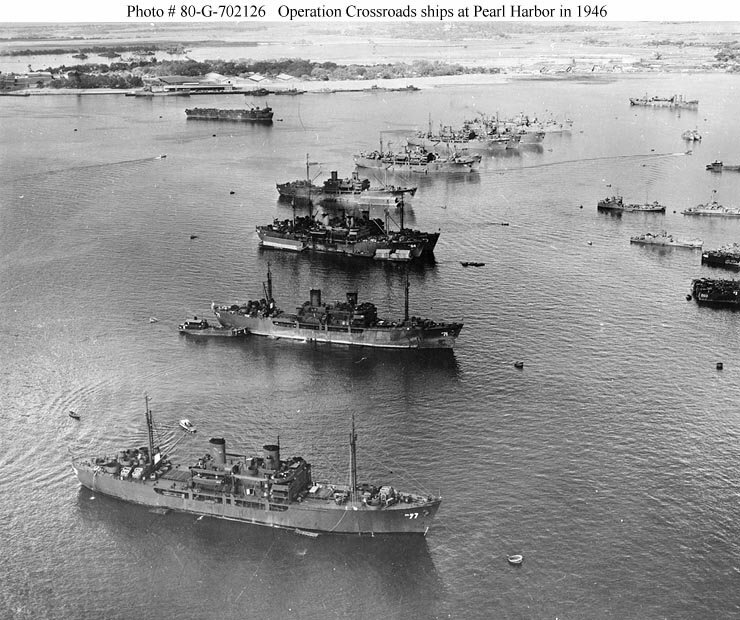 127k Operation Crossroads prospective target ships and support ships at Pearl Harbor in a photo released, 27 February 1946. Ships present from front to rear include USS Crittenden (APA-77), USS Catron (APA-71), USS Bracken (APA-64), USS Burleson (APA-67), USS Gilliam (APA-57), USS Fallon (APA-81), one unidentified ship, USS Fillmore (APA-83), USS Kochab (AKS-6), USS Luna (AKS-7) and an unidentified tanker and liberty ship. Identifiable on the right are USS LSM-203 and USS LSM-465. Further in the background are a floating drydock and a merchant ship hulk with unidentified fittings forward of the bridge. 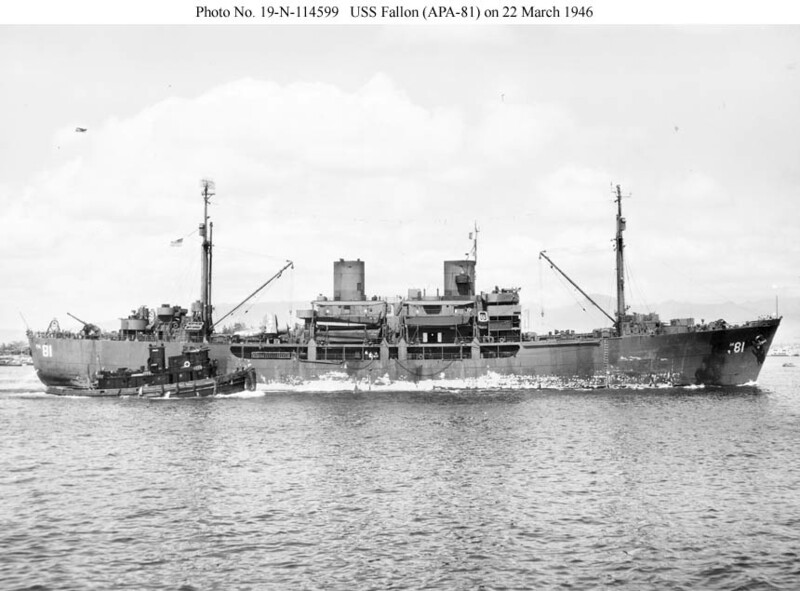 94k USS Fallon (APA-81) under way in Pearl Harbor, 22 March 1946.